Downtown Campbell is a vibrant scene, whether during the Sunday morning Farmer's Market or in the evening during the 'wine strolls', or on just any day or night when the dining crowds are out and about! Campbell is situated almost entirely 'within' San Jose - it borders Los Gatos to the south and the Willow Glen neighborhood of San Jose to the east - and is central to almost everywhere in Silicon Valley. East Campbell Avenue, once out of downtown, is a wide tree-lined street that has beautiful homes that are typically no less than 1 million dollars, when on the market at all! Generally, a home in Campbell can run anywhere from 800k to 1.5million, depending on size/amenities and location. There are some nice condo's nearby as well, in Hamilton Place, that have some great values right now and are in walking distance to eBay and Whole Foods. Since Campbell is also on the Los Gatos Creek Trail, it offers easy access for commuters who like to ride their bikes to the train stations, as well as families who like to trek to nearby parks, such as Vasona, for fun and relaxation. The schools are great and the downtown is eclectic, with restaurants such as Tigelleria Organic Restaurant at one end, all the way to the Pruneyard Shopping Center at the other end, featuring movie theaters, restaurants and numerous shops. Other restaurants, such as La Pizzeria with its fantastic, truly Italian pizza's and its neighbor, Katie Bloom's, with its pub fare and sports gazing, are just a small sample of what Campbell has to offer. 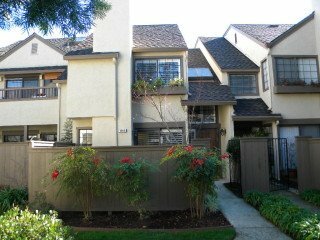 Cute 1 bedroom 1.5 bath townhouse at Hamilton Place!